Two miles south of San Pedro town on the shores of Ambergris Caye, Victoria House is an oasis of Caribbean colonial elegance and style. Operating for 30 years, the trophy chest of accolades and awards from the likes of Trip Advisor, Conde Nast Johansens, Travel & Leisure and Fodor’s are testament to the experiences guests can enjoy. The 42 accommodations are spread out throughout the lush tropical gardens and offer an extensive range of options, from the more simple yet elegant Staterooms, to the Luxury Villas and Infinity Suites, offering guests a broad spectrum of luxuries and prices. The Fantasea Dive Shop offers guests variety of activities from fishing, diving, snorkeling, birding, cave tubing… all orchestrated seamlessly by the activities director. Enjoy spa treatments in your room or on the beach, go on a jungle adventure, explore San Pedro by golf cart, or relax in a hammock. Your dining needs are served by the laid back Admiral Nelson’s Beach Bar, with a palapa thatch roof and casual dining verandah. Only a few feet from the water’s edge and pier, it is the perfect place to enjoy some great island style food. The Palmilla Restaurant is romantic and more upscale, serving a mix of island seafood and continental cuisine in either the air-conditioned candle-lit restaurant, or outside on the patio for some al fresco star spotting. 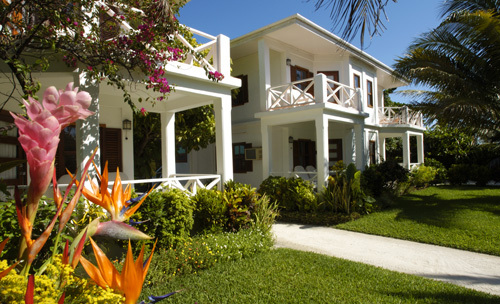 Located 1/4 from the second largest barrier reef in the world and situated on the spectacular Ambergris Caye, Victoria House combines extraordinary service and luxurious accommodation, making it one of the top choices for a Belize luxury vacation. There’s a dizzying number of accommodation options, ranging from the simpler Staterooms to the 3,500 square-foot Casa Azul Villa, with five bedrooms, a private pool and garden overlooking the Caribbean. For something in between, the thatch-roofed Casitas, furnished with locally handmade mahogany beds, offer private verandas and views of the sea. All three staterooms are located on the upper level of the main buidling and feature a queen bed, shower, Belizean wood furnishings, in-room safe and a mini bar. The staterooms are accessed from a shared wrap around balcony and offer a garden to ocean view. The charming, thatch-roofed casitas are decorated with locally handcrafted mahogany queen beds draped in custom mosquito netting, allowing you to enjoy the cool evening breezes and, for those that prefer air-conditioning, each casita is centrally cooled. The seven thatch roof casitas all face the Caribbean Sea, visible over the lawns, palm trees and white sand beach. Eight Plantation Rooms are located in two buildings facing the beach, surrounded by tropical gardens. 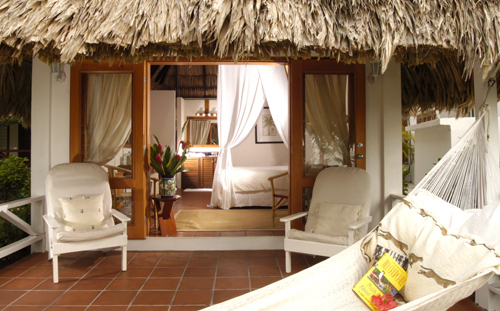 Each room features a private entrance and verandah with views of the gardens, pool and beach. All eight rooms have colonial plantation-style interiors with a king size bed draped in custom-made linen canopies. All Plantation Rooms are fully air conditioned. Victoria House has a range of suites – the Rainforest Suite is an individual casita set approximately fifty feet from the waters’ edge. It features a wrap around verandah with comfortable chaise lounges and a magnificent four-poster bamboo bed facing the beach. The Plantation Suites are located on the second level of the main building and feature king size bedrooms draped in signature mosquito canopies. The Tower Suite is located beachfront in Casa Azul and is accessed from a beach level open stairway leading to a large second floor sundeck. The over sized master bathroom, located on this level, boasts a walk-in shower and jacuzzi. A mahogany staircase leads to the third level and into the dramatic bedroom/sitting room area featuring vaulted ceilings and a king size four-poster Bamboo bed. Both the bedroom and sitting area open to a private verandah of the Villa offering panoramic views. The two, one-bedroom infinity suites each have a spacious living room, dining area and full kitchen. Both two-bedroom infinity suites feature a full kitchen, living area and queen canopied bed guestroom with a full bath on the ground level. All suites have a private terrace with great views of the pool and beach. Upstairs the suites features an over sized master bedroom, king size canopied bed, double vanities, walk in showers, living area and a large furnished private verandah in both front and back of the suite, perfect for watching sunset and sunrise. They are both approximately 1,176 sq feet. Offering accommodation options for groups or families, there is a range of two-bedroomed, three-bedroomed and the magnificent five-bedroomed villa, Casa Azul. Two bedroomed Casa Playa Blanca has the king bedrooms and the living room opening onto a spacious deck with a private infinity pool. The bedrooms connect on either side of the living room/kitchen and dining room area. The three bedroomed spacious Casa del Sol is a plantation style house with a ground floor king master bedroom, two privately accessed upstairs king bedrooms and a living room, dining room and kitchen that all open to an over sized covered verandah. 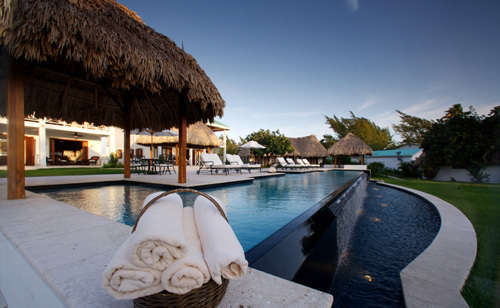 Casa Azul is a stunning five-bedroom beachfront villa with a living area of over 3,500 sq feet. This beautiful house offers a private pool set in lush landscaping overlooking the Barrier Reef. The pool is reserved exclusively for Villa guests. The three exquisite two-bedroom Luxury Villas are single story with traditional thatch roofs, spacious living areas, dining areas and full kitchens, along with two large master bedrooms with mahogany poster king size canopied beds and indoor/outdoor private shower gardens. The Luxury Villas also have furnished private terraces overlooking the infinity edge pool with views of the gardens, beach and Caribbean Sea. Venturing beyond the resort, you will be spoilt for choice being just two miles south of San Pedro town. As well as the delicious range of authentic local cuisine available, Belize is really ‘upping the ante’ on the international fine dining scene, giving you the best of both worlds. Somewhere not to be missed is the award winning Rojo Lounge, the restaurant at Azul Resort, located 5 miles north of town (concierge will advise on water taxi transportation for you). Rojo is a hip and exclusive loungey spot that has won Fodor’s choice three years running. The grouper cakes served with fire roasted red pepper and coconut dipping sauce and the key lime pie margarita are a must! Wild Mangoes located on the beach in the heart of San Pedro town serves ‘nuevo latino’ cuisine, Caribbean food infused with spicy latin influences from Cuba, Mexico and Argentina. The rum glazed bacon wrapped shrimp and the plantain crusted tilapia ensure that bookings are absolutely necessary. Blue Water Grill is a popular lunch and dinner spot on the beach in San Pedro serving a wide range of Belizean and International cuisine, so something for everyone. Sushi is served on Tuesday and Thursday and we are big fans of the aji poke salad. For a truly rustic and authentic Belizean experience, check out El Fogon in San Pedro, where the five or so dishes that change daily are cooked in cast iron pots over an open fire pit. It is located one street down towards the lagoon from the arrivals section of the airstrip, behind a wooden fence. The Reef is a San Pedro local institution serving fresh fish and seafood cooked in a variety of styles. The coconut shrimp comes highly recommended. Located on ‘middle street’, just ask around. Red Ginger in central San Pedro is a smart and creative restaurant attached to The Phoenix Resort. The cuisine is a combination of local Caribbean with an international twist in air conditioned surroundings. The Palapa Bar is a fun and friendly ‘over the water’ bar which attracts a good crowd, especially on Sundays. The bar food is tasty (burgers, sandwiches, etc) and you can look out for rays and dolphins in the waters surrounding. Located 1 mile north of San Pedro town. There are a wide range of different rooms available at Victoria House, please contact us to find out which one would suit you best. Rates start from US $199 per night for a State Room to $2,195 for a 5 bedroom villa, 9% Govt. Room Tax & 10% Service Charge are applied. Rates vary according to time of year. 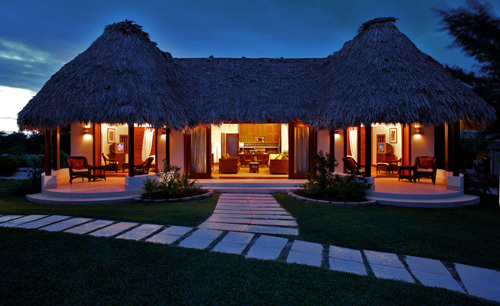 Please contact us at Absolute Belize for room availability and more detailed pricing. Heaven! – “My husband and I just returned from our honeymoon. We stayed at Victoria House for the first part of it (Southern Belize for the second part). I honestly have nothing bad to say about this resort. We LOVED it. All of the staff were extremely friendly – they all went above and beyond. Always had a smile on their face and wanted to make sure you were having the best experience possible. Our room was spacious and comfortable – we had a great view and I had the best sleep I have had in a long time (our bed was sooooo comfy). We did book a snorkeling trip and it was extremely easy to do. We also rented golf carts through the resort so we could tour San Pedro – such a great accommodation. We also thought the food was delicious – every meal we had was perfect. I wish we would have stayed at this resort the whole time. It was truly the best resort”.